While Canadian gamblers are all grown up, there's still something a bit eerie about childhood fears. The Monsters in the Closet slot machine from Microgaming plays on one of those fears in a cute yet spooky sort of way. It features ghosts and other creatures across the five reels and 50 paylines, and you can even check out the Monsters in the Closet free play slot demo that is featured on this page with no registration and no download required. When you are ready to win the real cash prize, you can go to Royal Vegas Casino where you'll get a series of 100% matches on your first several deposits worth $250 each along with 75 free spins on their Lucky Witch machine! You can customize your bet amount a great deal thanks to all of the options that Microgaming has provided. You can choose coins ranging in denomination from a penny to $0.20, and since you can spend up to 10 per line, this means that the per-spin wagers can vary from $0.01 to $100 to fit all budgets. Of course, it's best to activate all of the 50 lines so a minimum of $0.50 is always recommended. The jackpot here is 20,000 coins which ranges in value from $200 to $4000 depending upon your choices. There are some awesome animations that occur when you line up winning combinations, and this can be helped out with the wild that is provided in the form of the Title Logo which substitutes for all other winning symbols. Then, whenever you get three or more of the Bull scatters, you'll get 15 free spins during which all of your wins are tripled. These can be retriggered at any time. Finally, there is the Skeleton Key which triggers a bonus in the form of a multiplier of 1x, 5x or 50x whenever three, four or five appear during the free spins feature. If you get five of these during regular play, you'll need to open closets to reveal valuable monsters worth up to 75 times your initial stake. If you enjoy this particular title, then another title that you are sure to love is Under the Bed from Betsoft. This one boasts amazing 3D graphics, similar coin denominations, and a top jackpot that is worth a much smaller $1250 at the maximum. 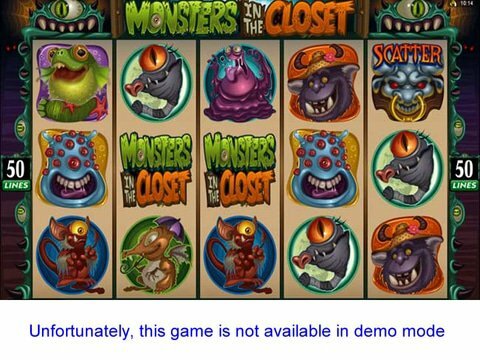 Though the Monsters in the Closet slot machine is not yet available on mobile, Under the Bed certainly is.